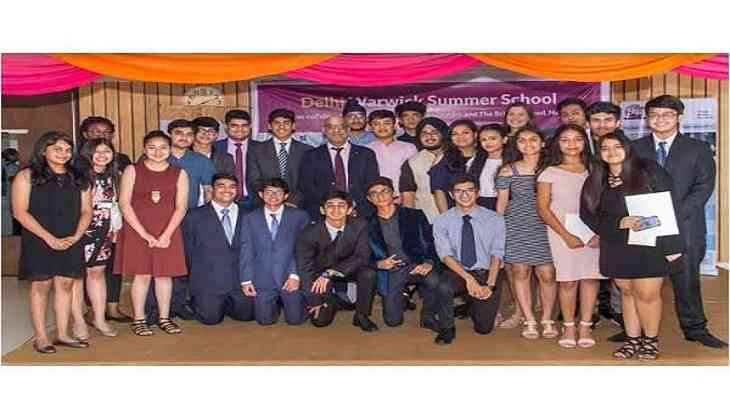 Delhi Warwick Summer School 2017, a special learning programme for the students successfully concluded with students from all over the country participating to make the most of this unique learning opportunity. This was the third chapter of this annual event: a collaborative effort between The British School and The University of Warwick (UK). The five-day programme offered a unique course, Economics with Finance, which provided students with a unique insight into what it would be like to study these subjects at an undergraduate level. In addition to the academic lectures and seminars, it also included personal development and soft skills sessions where the focus was on strengthening key life skills such as communication techniques and effective teamwork. The Summer School was led and taught by Professor Abhinay Muthoo, Professor of Economics and the Former Head of the Department of Economics and currently the Dean of Warwick in London, and he was supported by Bozhena Kelestyn, Doctoral Researcher and Teaching Assistant in the Warwick Business School. "Economics remains the big issue of the day. Understanding why markets fail or how we can better address our most stubborn public policy challenges are just some of the pressing questions facing economists around the globe. I'm excited to be part of this collaboration in the heart of Delhi. I want this experience to show students what it is like to learn economics or finance at degree level in a top University like Warwick and in so doing I hope it inspires them to explore the disciplines further. I'm also delighted to be working with such a fantastic partner as The British School who provided the very best facilities and environment for the students," said Professor Muthoo. The Summer School culminated in a formal, gala reception to which students and parents were invited. The evening featured the formal graduation ceremony marking the successful completion of the course. Students were awarded prizes based on the skills sessions as well as one for overall Top Summer School Student. "The five-day programme led by Professor Muthoo and his team from Warwick gave students a remarkable insight into the fascinating world of Economics and Finance and a definite edge as they prepare for higher education here or in the UK. The synergy between our two institutions and our shared passion for promoting excellence in education has once again made an amazing academic experience accessible to our students at home," said Vanita Uppal OBE, Director- the British School.